Moving time: 4 hr 22 min. It was another fast day of interstate riding with Joe again today. Interstate 90 continued its downhill run into Missoula - we dropped about 1000 feet today and did very little in the way of climbing. About half way through Colorado Joe picked up some licence plates off the side of the road for fun. Ever since it has become a game to see how many plates we can find in a day. Today saw a treasure trove of lost license plates on the side of the road. I picked up plates from Texas, Idaho, Wyoming, British Columbia, and two from Montana today alone. This brings to 20 the number of plates we have picked up in the past few weeks. There was only one significant stop before we reached Missoula and that was the Rock Creek Lodge just west of Missoula. 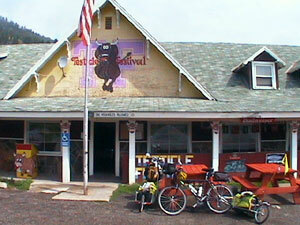 They have hosted Montana's Original Testicle Festival since 1993. What? That's right. They host over 10,000 people at this annual event to celebrate the famed Rocky Mountain Oyster (deep fried bull testicles). Donna Ikenberry features this as the stop of the day in her book, Bicycling Coast to Coast and Joe and I had to check it out. Rocky mountain oysters are served in many restaurants and bars here in the western states. I have seen them on the menu at over 12 establishments since entering Colorado a few weeks ago. Here's a picture of me riding a bull inside the Rock Creek Lodge. 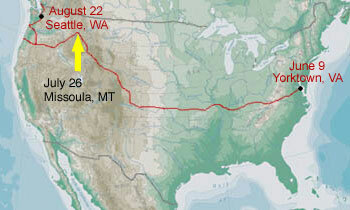 You can compare my bull riding ability to that of day 40 when I rode one in Lander, Wyoming. 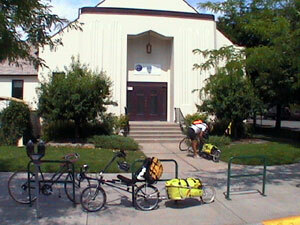 The highlight of the day was reaching the Adventure Cycling Association headquarters in downtown Missoula. Their well-kept building serves as the headquarters for the organization and acts as a museum to the bicycle route network. 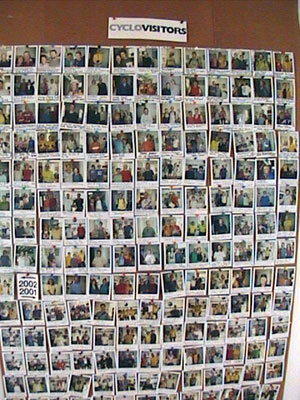 Joe and I met with Greg Siple, the organization's art director, who gave us a tour of the building, offered us cookies, ice cream, and soda, took a Polaroid for the photo collage on the wall, and took a studio photo for inclusion in his archive of thousands of photos of cyclists with their bikes. 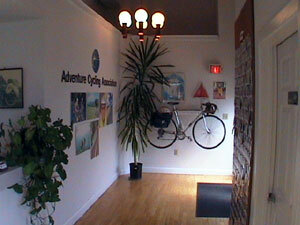 Each month the Adventure Cyclist magazine features one rider who stopped by the office on their journey. Greg is a great guy who spent a good deal of time sharing his photographs and experiences with us and made us feel completely at home at our organization's headquarters. He shared with me a book called It's All Up Hill by Keith Dunston, an Australian, after his 1976 BikeCentennial ride. I'm going to try to find a copy this fall. The first shows our bikes outside the front door of the office. The second shows the entrance way to the building. On the far wall is the bicycle that Carla Majernik, the chief cartographer for ACA, rode on the TransAm in 1976 when the route and event was known as BikeCentennial. The third picture is a mosaic of photos taken of every bicycle tourist who stops by the office during their journey. We noticed that there are quite a few westbounders only a few days ahead of us. It's amazing to know that I'm not the only one crazy enough to do what I'm doing. 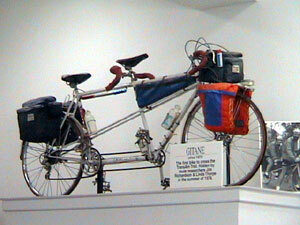 The fourth shot is of the first bicycle to make it across the TransAm route in 1974 as a trial run for the main event in 1976. Missoula is a very biker-friendly town. There are bike lanes and wide shoulders among most city streets and the generous sidewalks sport bike racks every twenty feet or so. Drivers yield to the many people who bicycle to work, the store, or for pure recreation. It's a nice change from the frantic and sometimes dangerous traffic conditions I've faced for many of the past 3200 miles. I missed a mail drop in Crowheart, Wyoming and had the box forwarded to Missoula for a second try. It was here when I arrived and I picked up my maps, fuel, food, and parts that I have sorely needed for the past week. Joe and I went to see Austin Powers 3 - Goldmember at the theater by the campground. It's the second movie I've seen on the trip so far and it gives me a taste of the real world for a short time. We met up with Corrin and Travis again today after they sped ahead nine days ago. They took a day off today which gave us time to catch them. We shared a campsite.